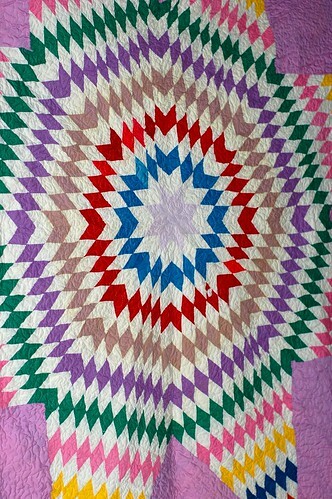 My Grandmother has a collection of quilt tops that were HAND PIECED by my great-grandmother and other various women in my family. 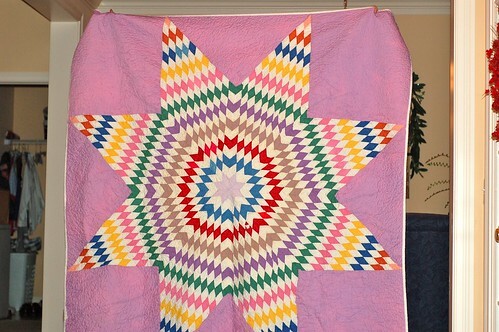 She bought this particular quilt top for $15 from her mother-in-law sometime in the 1960's. My mom was able to get me the quilt top so I could finish it as a Christmas gift. Given the age of fabric there was some yellow and brown staining on the quilt top. I tried to use Retro Clean to brighten it up, but that kind of backfired. Although it worked great on some embroidered hankies I had, the Retro Clean caused all of the brown fabric in the quilt to bleed out. After extensive soaking and washing, most of the damage was mitigated - but I'd be lying if I said I didn't shed a few tears over the fear of ruining a family heirloom. Machine quilting was another challenge. The quilt top was not square and even though I tried, I had to tuck and fold the fabric to get it to lie flat. There were also several holes in the fabric, so after much consultation with the ladies of Generational Viewpoints, I used a layer of 110" muslin between the batting and quilt top and then tacked down the edges of torn fabric (see photo above). All in all I was really happy with outcome and I think my Grandma was too. That quilt was huge...I had no idea that you were wrestling with that much material under your sewing machine. 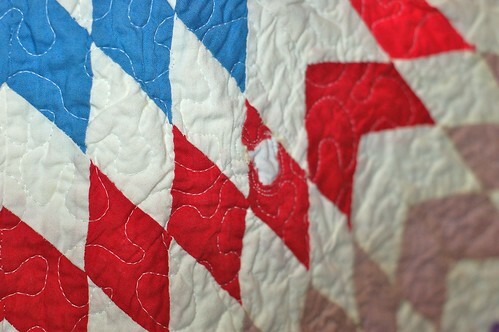 You deserve kudos for quilting it and the pictures look great.